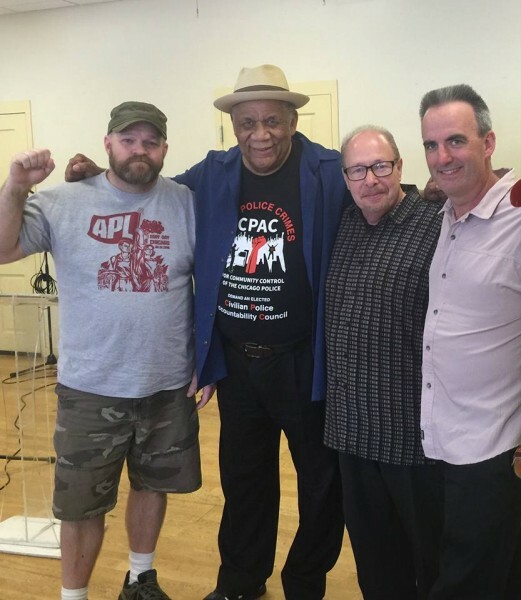 Interview: 50 years of Young Lords with founder Jose “Cha Cha” Jimenez | Fight Back! Fight Back! interviewed Jose “Cha Cha” Jimenez, the founder of the Young Lords. A Young Lords 50 Year Commemoration is taking place at DePaul University in Chicago, starting at 6 p.m. on Friday, Sept. 21. Jose “Cha Cha” Jimenez and freed political prisoner Oscar Lopez Rivera will be speaking together on the struggle of the Puerto Rican people. Also, there is a Young Lords 50 Year Memorial Tour to honor the church people, Young Lords, and Black Panthers who died in the struggle, starting at noon, Saturday, Sept. 22. Fight Back! : Who were the Young Lords? Jose “Cha Cha” Jimenez: The Young Lords were a turnaround street gang, which saw their community being evicted or displaced and decided to stand up and fight city hall. They recruited from the entire community and mobilized them into pickets, occupations of local institutions; protest marches and organized with others into coalitions. These included coalitions with Black Active and Determined; the North Side Cooperative Ministry - pastors of several churches; the Lincoln Park Poor People’s coalition -neighborhood wide group of businesses, churches, organizations and street youth groups; Latino gang clubs; and the Rainbow Coalition - Black Panthers, Young Patriots and Young Lords and later joined nationally with AIM, Red Guard, Brown berets and others. Fight Back! : How were the Young Lords founded? Jimenez: You cannot separate the Young Lords from world events at the time. The ‘68 Democratic Convention took place down the street in Lincoln Park and Grant Park and that had a tremendous effect on the adjacent Lincoln Park Neighborhood where the Young Lords were located with several ‘gang’ branches. The Latino community, specifically the Puerto Rican community, had just been displaced from other areas near downtown and pushed into Lincoln Park. Growing up, families faced discrimination from city hall and from local white ethnic communities who feared their neighborhood was being taken over by the new Puerto Rican immigrants. Puerto Rican youth had to form gangs to protect themselves. All this had an impact on people’s lives. We got into gang fights and drugs. I went to jail for drugs and began reading. Since I was still the president of the Young Lords gang, I was able to educate myself in jail and steer the gang into a different direction. However, it was the times and conditions, along with examples from many groups including the Chicano movement, the Puerto Rican Independence movement, The Black Power movement, the anti-war movement - Lincoln Park was a haven for hippies - which contributed to helping us change together. The Puerto Rican Nationalist Party, Movimiento Pro Independencia and Black Panthers played a major role. See the Schomburg museum article on what happened when I was in jail to lead me to changing the mission of the Young Lords gang. Fight Back! : What type of community organizing did the Young Lords do? Jimenez: I began doing street corner to street corner and bar to bar visits and then used my living room as a study group and sleep pad, since I was being evicted for non-payment of rent. We then studied right on the street corner by discussing news events or reading Mao Tse Tung’s Red Book while drinking wine, beer and smoking weed. Groups like LADO and especially Concerned Citizens of Lincoln Park were instrumental in helping to educate the members. It started like the size of a bean and grew like the size of a watermelon. It then spread to other cities via the then tabloids owned and published by all left-wing organizations. Fight Back! : What successes did you have? Jimenez: Everything we did was a success because our philosophy was always to turn all negatives into positives. Our people needed self-sustaining leaders to help them stay motivated and not leeches. We were kicked out of Lincoln Park but we built and sustained a Puerto Rican national liberation movement. It is why the U.S. will never be able to steal Puerto Rico from us because the Young Lords trained a new generation. It is why the Young Lords are role models. Fight Back! : How did Young Lords see the world? Did your ideas develop over time? Jimenez: We are a part of an international struggle as well as a local struggle. As Chairman Fred Hampton once said, “How can you go all the way to Vietnam without first crossing through the West Side of Chicago?” You cannot fight for Free Puerto Rico without fighting Mayor Richard J. Daley and his gentrification policies. But that is what our local leaders did. They even attacked the Young Lords to get crumbs from the Daley machine but the people will one day see right through their sellout boot-licking policies. Fight Back! : Did Young Lords work with the African American movement? What about others? Jimenez: Of course. Of course Puerto Rico is a direct colony of the United States the internationalist capitalist oppressor of the working class all over the world. Both the Black Panthers and Young Lords stand for working people especially the lumpen class that is the most oppressed section of workers. Everything progresses or degrades via a process, which is inter-related to time, conditions and place. You cannot compare the nation of Cuba to the nation of Puerto Rico. Cuba has already made a great revolution. But Puerto Ricans as a whole are only beginning to realize that they are a colony of the United States. They live under a system of capitalism not socialism. I cannot ask them to join the 10th International without first realizing that they are Puerto Ricans and that their names are supposed to be Pedro, Maria and Jose and not Peter, Mary and Joe. Puerto Ricans must go through a struggle for self -determination first; a nationalist struggle. In the process, they will realize the need for a class struggle. This involves practice not theory. Fight Back! : What happened to the Young Lords? Jimenez: The question is what happened to the white left, who decided to abandon the Black Panthers and Young Lords when things got hot, as if these groups who risked everything were just, some kind of a fad or that their movement was just some kind of entertainment. Think about this. The Black Panther Party Offices are blown away by police bullets, burned down and replaced by a Walgreens and their leader Chairman Fred Hampton is assassinated by a goon squad from Mayor Daley, the FBI and the Illinois state’s attorney’s office. And so now there is no office and the entire chapter of the Black Panthers is forced to break up and go underground. Think about the Pastors of the Young Lords People’s Church are stabbed and the police is trying to insinuate that maybe it was the Young Lords. I have 18 felonies on me and the Young Lords entire central committee is forced underground to Tomah, Wisconsin. Can you imagine that environment and conditions? The Young Lords did not run away like some in the white left did. We came back and fought Daley and COINTELPRO directly by uniting with others and mounting a successful aldermanic campaign that raised the morale of the entire movement. This campaign led to other campaigns in the Latino community and coalesced with other campaigns in the Black community and progressive white communities and this movement led to Harold Washington’s campaign and finally to Barack Obama’s victorious presidential campaigns. The Young Lords are a skeleton group today due to repression not only by the pigs but also by some opportunists from the left. Yet we have never stopped fighting and every year I do an event, and I am still head of the Young Lords no matter what city that I live in. I call the shots. There are many Black Panthers still left in jail or underground and in exile, in places like Cuba. The cases of Reverend Bruce Johnson and his wife Eugenia Johnson and Reverend Sergio Herrera, who were stabbed multiple times are still unsolved cases. These were United Methodists pastors but the Young Lords entire central committee was forced underground then and unable to show support for them. Young Lords Manuel Ramos, Pancho Lind and Julio Roldan were also killed without justice being carried out. We will not forget them. We will always be reminded of how COINTELPRO and others have worked to split our movement so that we cannot organize together to free our nation of Puerto Rico. We will always work for unity. “Unidos venceremos” or “United will win!” It is not just a saying for us. It is a goal. Fight Back! : What lessons do you want to convey as 50 years of Young Lords approaches? Jimenez: That ours is a protracted struggle until victory and beyond!